This Carrot and Ginger Soup is the perfect one-pot spring soup – Cozy and satisfying but loaded with vibrant flavours. Plus, it’s dairy-free, gluten-free, vegan and ready in just 30 minutes! This Spring has been a bit cooler than expected so far, so even thought I can’t wait to dig into refreshing salads and ice cream treats, I’m not quite ready to give up on soup just yet. 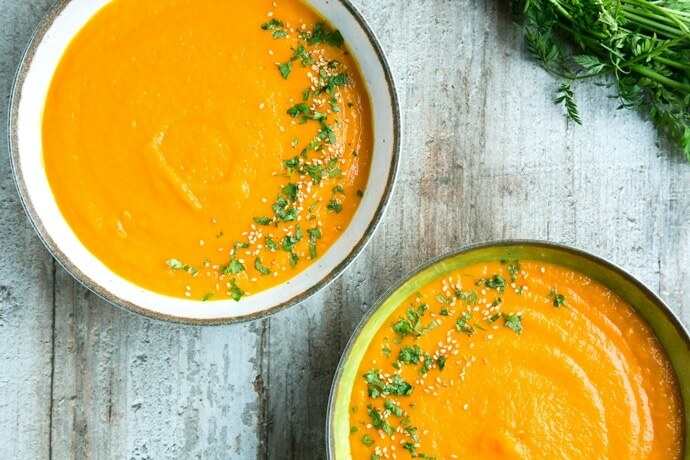 This Carrot and Ginger Soup happens to be just the perfect spring soup, it’s heart-warming and cozy, but loaded with vibrant, delicate flavors of the season. It’s big on flavor and low on effort. And as an added bonus, it’s naturally dairy-free, gluten-free, vegan. Did I also mention that it tastes absolutely delicious? It’s the kind of recipe you’d be happy to dig in at home or at work on a cold day. It also freezes beautifully, I usually double up the ingredients and freeze half the soup into portions, ready to heat whenever I crave something warm and comforting. 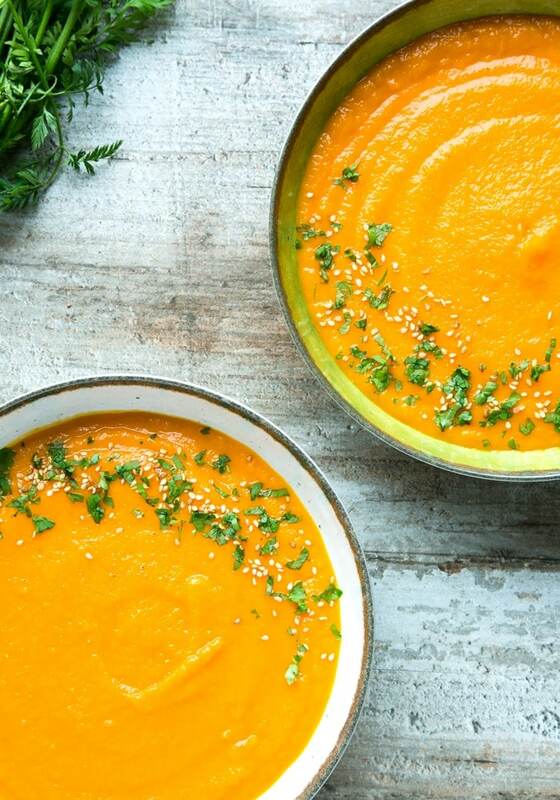 This Carrot and Ginger Soup recipe is ready in less than 30 min and incredibly easy to make, requiring just one pot and simple wholesome ingredients: organic carrots, onion, potatoes, spring onion, fresh ginger, good olive oil and a mix of favorite spices. I used a combination of cumin, turmeric, paprika and sumac (if you can’t find it, substitute with lemon zest). This mix brightens up the sweet and delicate flavor of the carrots as well as adding lots of anti-inflammatory benefits. For an extra spicy kick, add some chopped fresh chili or a drop of chili oil before serving. The recipe for this delicious soup couldn’t be simpler. Once you chop up all the veggies, drop them in a large pot with a generous glug of olive oil, and stir-fry until they’re nicely caramelized. Pour the stock and continue to cook for about 15 minutes. Finally, use a hand-blender or a blender, and blend all ingredients directly in the pot. I like to scoop 1-2 cups of stock out of the pot before blending all ingredients, and then slowly blend in just enough stock to bring my soup to the right creamy and velvety texture. 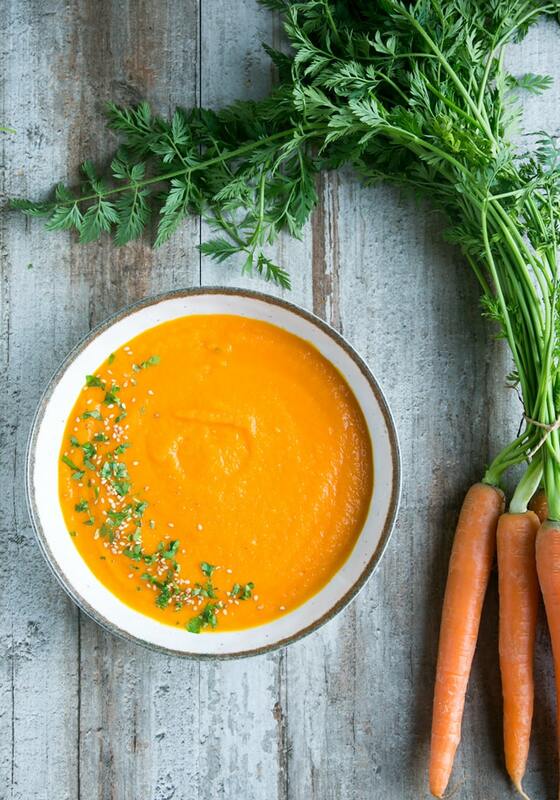 This vibrant Carrot and Ginger Soup is one of my favorite meals to eat all-year-round. It’s quick, delicious and packed with nutrients. It makes a great light lunch, and works just as great as an entree followed up by a hearty dinner meal. 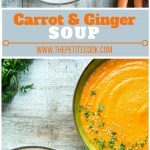 This Carrot & Ginger Soup is the perfect one-pot spring soup - Cozy and satisfying but loaded with vibrant flavours. Plus, it’s dairy-free, gluten-free, vegan and ready in just 30 minutes! Add a generous glug of olive oil in heavy large pot over medium-high heat. Add onion and sauté until translucent, about 4 minutes. Add grated ginger and garlic, and sauté for 1 more minute. Add chopped carrots, finely cubed potato and spices and sauté 1 minute. Season with a little bit of salt & pepper. Pour the stock in, cover with a lid and bring to boil. Reduce heat, cover partially and simmer until carrots are very tender, about 15 minutes. Remove 1 or 2 cups of stock and set aside. Using a hand-blender or a large blender, blend the soup, whilst pouring the stock until reaching a creamy velvety texture. Season to taste with salt and pepper, drizzle with a little bit of oil and top with extra spices if you like. Serve with chopped parsley, sesame seeds, and toasted rustic bread if you like.